2015 kitchen paint trends bring nature inside with muted tones of green, yellow, blue and tan that pair perfectly with natural-wood finishes or classic white. No matter your color palate, though, don't forget to drench your "fifth wall" in the shade of your choice. 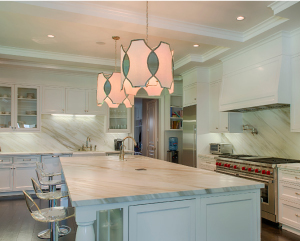 Painted kitchen ceilings are becoming increasingly popular. 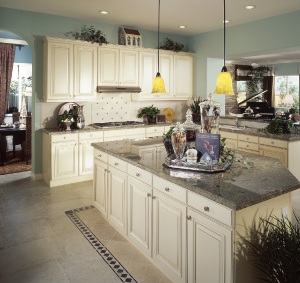 To make a small kitchen feel more expansive, paint the ceiling one or two shades lighter than the walls. To make your cooking area feel more cozy, choose a darker shade that complements your lighter walls. Keep the insects out, the breeze flowing in... and roll it into its hidden casing when you don't need it! Phantom Screens offers door screens that are the ultimate in convenience and style. 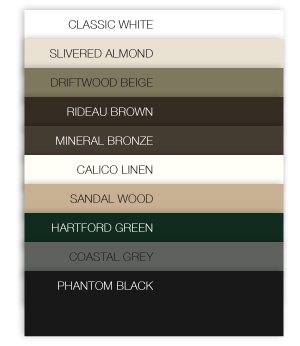 Choose frame colors like Classic White, Slivered Almond, Sandalwood, Driftwood Beige, Rideau Brown, Hartford Green, Coastal Grey, Bronze, Linen and Phantom Black. If none of these colors suffice, just show them a color swatch and they will match it. Of course, the colors illustrated here may differ slightly from actual coated samples or finished pieces. No matter what color you choose, you'll love the convenience of Phantom's new Legacy Latching System that does away with the magnet! Spring has sprung! It's that time of year to reinvigorate your interior with splashes of color - but that doesn't mean your kitchen should look like Punky Brewster's bedroom. Rebecca Rollins Interiors (RRI) masters the art of bringing daring color into living spaces without the risk of it looking too flashy. 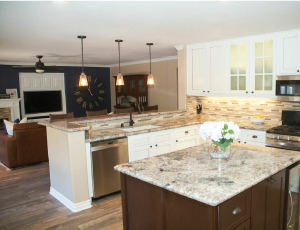 Shown here are RRI's recent kitchen and family room remodels. The bold indigo blue accent wall in the living spaces ties in flawlessly with the Diamond Arrow granite that has traces of blue stone. Visitors can gaze at this design all spring and still not catch every subtle detail. non-committal colors, especially the "greiges" (combination of gray and beige). This warmer shade of gray, currently seen in countless design magazines and model homes, is our favorite neutral. It is great for re-sale or for any homeowner who struggles to blend both warm and cools tones. Incorporate it in the kitchen via a quartz slab by Caesarstone called London Grey. It is the perfect blend of gray with a slight beige undertone that will allow for you to warm up the cool look of a marble kitchen counter. 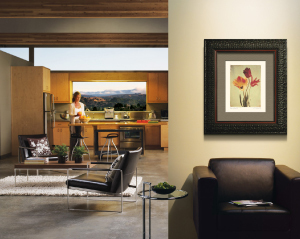 Custom framing can transform your kitchen into an elegant showcase. The first consideration when framing artwork is to surround it with the colors, textures and dimensions that will show it off in style. Great design involves choosing mats and moulding that bring out the best in the art. Textured mats are one of the most prominent trends today because they add a sense of depth and richness to the final design. Textures often exude a vintage look, complementing today's home decor. Metallic textures make a bold, strong statement. Antique finishes in rustic pewter, tarnished coppers and weathered golds are design alternatives to bright, shiny metallic tones. Textures today have an emphasis on creating a timeless, classic look. Mats with a crackle or gilded finish are ideal choices for folk art and antique prints. The texture adds life and quietly brings out the best in the artwork. Coarse-weave fabrics tend to follow trends in fashion and fabrics, presenting creams and reds as well as blacks, golds and soft greens. Mats featuring wide stripes and subtle patterns that mimic wisps of smoke create an interesting, eye-catching design. Quiet, subtle designs and textures on the mat create an added flavor to the art. Textured mats are offered in conservation and preservation-quality grades in assorted colors.